Do You Stand When Reciting the Pledge of Allegiance? Yes...you should stand at attention, reverently facing the flag. Standing is a sign of respect. Should You Salute When Reciting the Pledge of Allegiance? 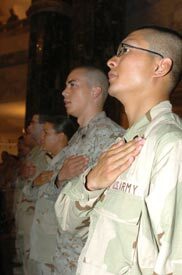 Previously, only members of the military (in uniform) could give the flag their military salute, but now veterans not in uniform may salute the flag as well. All others, should place their right hand over their heart. If men are wearing hats, they should remove their hats, and use their right hand to put the hat at their left shoulder (so that their hand is over their heart). At one time, some people would begin the pledge with their hands over their hearts, but would extend their right hand towards the flag (palm up) at the words 'to the flag'. Their arms would remain extended for the remainder of the pledge. During WWII, this practice was abandoned, as it was so similar to the salute that Nazis rendered to Hitler.